A few weeks ago on a Friday night I was eating dinner at a local BBQ joint with some friends. As we’re chowing down on ribs and pulled pork, I spotted a big bowl of macaroni and cheese on my friend’s plate. Trying to abide by the Diet It Up lifestyle, I opted for a side of corn on the cob instead of the ooey, gooey macaroni. But, that mac & cheese looked damn good! 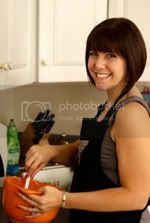 Fearing her dinner would soon become a victim of my wandering fork, my friend challenged me to come up with a mac & cheese recipe that won’t leave us girls (or guys) feeling like we just ate a pound of dairy. A challenge? When do I ever shy away from a culinary adventure? Little did my cheese-addicted friend know that she would soon be recruited to come over on a Sunday afternoon to act as honorary taste-tester. This one’s for you, Cyn. My Hearty Mac & Cheese is adapted from an Ellie Krieger recipe. I made a few of my own tweaks to bump up the flavor. I’ll tell you how the recipe tastes before scaring you off with the unexpected culprit in this diet mac & cheese caper. 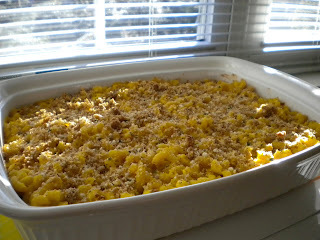 The macaroni is rich and creamy and the breadcrumb topping adds a little crunch. It’s cheesy and delicious. What makes this a Diet It Up entrée, you ask? The base for the cheese sauce is made with frozen pureed winter squash. Don’t walk away! There’s no reason to be afraid! It doesn’t taste like squash at all. The cheese is still the shining star of the recipe. I’ll admit, if you served this to me and pitched it as "the greatest mac & cheese you’ll ever have in your life" I might argue with you. But, it certainly doesn’t taste diety. This is a lighter alternative to classic comfort food fare. Some people live their lives by the credo, "everything’s better with bacon" but I’m going with the slogan, "everything’s better with CHEESE." Enjoy! Get cooking. Let me know what you think. Love it? Hate it? I’m interested in hearing your feedback and suggestions. A little side note. I ate the leftovers last night and threw some leftover taco meat on top and called it chili-mac. It reheated really well. The cheese didn't seperate and get all yucky the next day like regular mac & cheese. YUM! LOVE the recipe, and of course love the cooks! :) We had such a good time making it, and an even better time testing it. As for the fact that this Mac & Cheese is considered diet--even more awesome. I especially love the crunchy breadcrumbs added on top. A new favorite of mine for sure! Thanks, Trish! 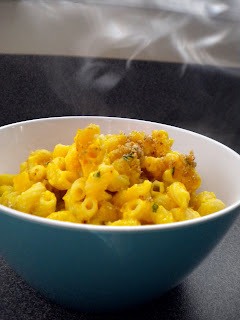 i love winter squash + its completely unexpected in mac+cheese! makes me wanna try it simply for my curiosity. also..love ur writing in this one!